Endowed with natural beauty and a great history, tourism is a flourishing industry in Rajasthan. State contributed to over 20% of India’s Foreign Tourist Arrivals (2013-14) and over 36.6 million tourists visited Rajasthan in 2015. Rajasthan also forms part of India’s golden triangle, a tourist circuit which connects the national capital Delhi, Agra and Jaipur. The second largest city in Rajasthan, Jodhpur is among the top 10 preferred destinations that travellers have on their wishlists for the upcoming year, a recent study has revealed. Tourism accounts for approximately 15 per cent of the Rajasthan’s economy and provides economic benefits like foreign exchange earnings, regional development, infrastructure development and promotion of local handicrafts. In Rajasthan, tourism accounts for 2.7% (5.2% after adding indirect effects) in Gross State Domestic Product and 1.9% (7.2% after adding indirect effects) in state employment. Tourism has a significant multiplier effect on the state economy. It increases employment opportunities, generating revenue, developing infrastructure, increasing investment opportunities and revival of traditions and heritage conservation and management . It is estimated that every rupee spent by a tourist changes hands 13 times and that every hotel room generates direct employment to three persons and indirect employment to eight persons. Tourism Industry is more gender neutral as compared to other Industries and women account for 65% of the international tourism workforce. For Rajasthan also tourism sector provides enabling platform for increasing labour force participation rate. Rajasthan Government has identified various projects to be developed in public private participation mode in tourism sector. Water based activities like cruise and boating in Chambal and other water bodies. Establishment of Golf Resorts and Convention centers. Night viewing of monuments at Jaipur, Udaipur, Jaisalmer, Bharatpur, Chittorgarh. Development of eco-tourism in various places in state. 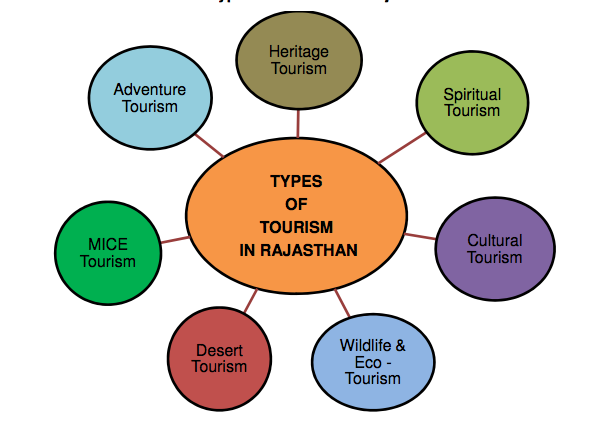 The Government of Rajasthan notified Rajasthan’s Eco-tourism policy in 2010. This policy has been framed with a view to sensitize the public , government departments, NGOs and others about eco-tourism and for laying down the framework for its growth in the State in a sustainable manner. Sunda Mata temple in Jalore district, Bassi in Chittorgarh district, Kumbhalgarh in Rajsamand district, Hamirgarh and Menal, both in Bhilwara district have been developed as per guidelines of eco-tourism. Rajasthan Government engagement with Singapore has led to a direct flight and a skill development centre for hospitality. Rajasthan Government also provides various policy incentives for development of tourist infrastructure including hotels, convention centers, tourist places. Development of a ‘Mega Desert Tourist Circuit’ comprising Bikaner, Jodhpur, Jaisalmer, Pali, Mount Abu and Sambhar. Rajasthan tourism 3.0 is a multiyear, multi-modal, multi narrative and multi-crore global campaign to galvanize tourism in the state. Rajasthan Tourism 1.0 lasted from Independence till the early 80s and was powered by Rajasthan’s landscape. Rajasthan Tourism 2.0 began in the 1980s with heritage hotels that married historical narrative with commercial hardware. But Rajasthan Tourism 3.0 ­ is government’s goal of 50 million foreign and domestic tourists ­ based on enhancement of Rajasthan’s current literature, music and folk festivals with new museums, exhibits and events, strong enough for tourists to plan itineraries around them. Rajasthan Government has launched a new aggressive campaign with tagline “Jaane Kya Dikh Jaaye” to market state among tourists. The campaign developed by Ogilvy consists of six films and development of the new logo of Rajasthan Tourism. Rajasthan Government has decided to renovate 11 religious sites to promote religious tourism in state. 50% additional exemption from payment of conversion charges for heritage property converted into a heritage hotel. All fiscal benefits to tourism units and heritage hotels will be as per Rajasthan Investment Promotion Scheme, 2014. Rajasthan continues to face challenges that impede its growth as a tourist destination. The state needs to improve on the sanitation of its public spaces and the ease of travel around the state so as to add to its international appeal. The state should also consider providing more online payment and reservation services as more tourists are resorting to using the internet to plan and book their holidays in India.